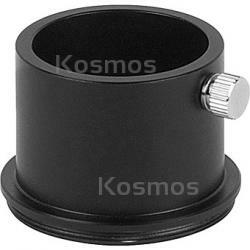 1.25" Imaging Flip Mirror Camera Adapter, Kosmos Scientific de México, S.A. de C.V. This handy adapter threads into our Orion Imaging Flip Mirror (sold separately) to allow use with 1.25" sized astrophotography cameras; such as our StarShoot Solar System Imager, StarShoot Planetary Imager & AutoGuider, and our StarShoot USB and Video Eyepieces (imaging cameras and eyepieces sold separately). Once installed on the Orion Imaging Flip Mirror, this 1.25" Camera Adapter enables you to acquire and focus an object using a 1.25" telescope eyepiece while an astrophotography camera with 1.25" nosepiece barrel is attached to the same telescope. You'll be amazed at how easy it is to achieve optimal focus for imaging with smaller cameras when using the Flip Mirror and Camera Adapter combination. Once the 1.25" Imaging Flip Mirror Camera Adapter is attached to the Flip Mirror, simply insert your imaging camera's 1.25" nosepiece and secure in-place using the adapter's thumbscrew. You can then place any preferred 1.25" telescope eyepiece into the upper 1.25" holder on the Flip Mirror, and manipulate the flip switch to alternate between the imaging camera and eyepiece. Using the eyepiece, focus the view, then switch back to the imaging camera to capture an exposure. Your snapshots and extended exposures will conveniently be in focus! The Orion 1.25" Imaging Flip Mirror Camera Adapter is made of black anodized aluminum, and features a thumbscrew for secure installation of imaging cameras with a 1.25" nosepiece barrel. ©2002-2019 por Kosmos Scientific de México, S.A. de C.V.